Known as the Kingdom of the Zulu, KwaZulu-Natal is a melting pot of African, European and Indian cultures. This province boasts two World Heritage Sites – the Greater St Lucia Wetland Park and the Ukhahlamba Drakensberg Park. Traditionally, a popular destination for holiday-makers, KwaZulu-Natal is South Africa’s busiest local holiday destination. KwaZulu-Natal, often referred to as "KZN", is a province of South Africa. Prior to 1994 the territory now known as KwaZulu-Natal was made up of the province of Natal and all pieces of territory that made up the homeland of KwaZulu. In the 1830s, the northern part was the kingdom of Zululand and southern part was briefly a Boer republic, called Natalia. In the 1840s, the latter became the British Colony of Natal, though Zululand (KwaZulu in Zulu) remained independent until 1879. It is called the garden province and is the home of the Zulu nation. Located in the southeast of the country, it borders three other provinces and the countries of Mozambique, Swaziland, and Lesotho, along with a long shoreline on the Indian Ocean. Appropriately named “South Africa’s Garden Province”, the lush and green province forms the east coast of South Africa from the Mozambique boundary southwards to Port Edward. The coastline is dotted with small towns, many of which serve as seasonal recreational hubs. The climate of the coastal areas is humid and subtropical, comparable to southern Florida in the United States, but not quite as hot and rainy in the summer. As one moves further north, up the coast towards the border of Mozambique, the climate becomes almost purely tropical. North of Durban is locally referred to as "The North Coast", while south is known as "The South Coast". The Kwazulu-Natal Tourist board includes towns like Margate, Port Shepstone, Scottburgh and Port Edward in its definition of what constitutes the South Coast, while Ballito, Umhlanga and Salt Rock are quintessentially North Coast resort towns. An extraordinary natural phenomenon, that is witnessed annually on the KwaZulu-Natal coast, during late autumn or early winter, is the "sardine run". 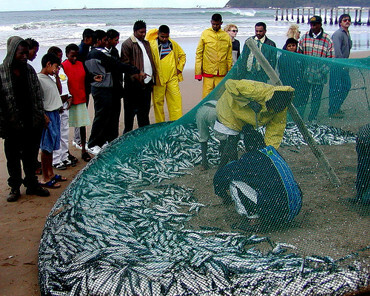 Also referred to as "the greatest shoal on earth", the sardine run occurs when millions of sardines migrate from their spawning grounds south of the southern tip of Africa, northwards along the Eastern Cape coastline towards KwaZulu-Natal, following a path close inshore, often resulting in many fish washing up on beaches along the coast. The huge shoal of tiny fish can stretch for many kilometres and is followed and preyed upon by thousands of predators, including game fish, sharks, dolphins and seabirds. Usually the shoals break up and the fish disappear into deeper water around Durban. Many questions surrounding this exceptional event remain unanswered. The interior of the province consists largely of rolling hills from the Valley of a Thousand Hills to the Midlands. These have been the subject of much literature. 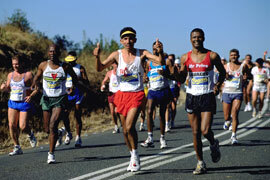 "There is a lovely road that runs from Ixopo into the hills. These hills are grass-covered and rolling, and they are lovely beyond any singing of it. The road climbs seven miles into them, to Carisbrooke; and from there, if there is no mist, you look down on one of the fairest valleys of Africa. About you there is grass and bracken and you may hear the forlorn crying of the titihoya one of the birds of the veld. Below you is the valley of the Umzimkulu, on its journey from the Drakensberg, to the sea; and beyond and behind the river, great hill after great hill; and beyond and behind them, the mountains of Ingeli and East Griqualand." The KwaZulu-Natal's provincial government sits in the legislative buildings in Pietermaritzburg. The site where the legislative buildings are situated was occupied by St Mary's Church, which was built in the 1860s. A new church was built at the corner of Burger Street and Commercial Road, and opened in 1884. The old building was demolished in 1887 to provide space for the legislative complex. The foundation stone of the new legislative building was laid on 21 June 1887, to commemorate Queen Victoria's Golden Jubilee. The building was completed two years later. On 25 April 1889, the Governor of Natal, Sir Arthur Havelock, opened the first Legislative Council session in the new building. When governance was granted to Natal in 1893, the new Legislative Assembly took over the chamber that was used by the Legislative Council since 1889. Further extensions to the parliamentary building were made. 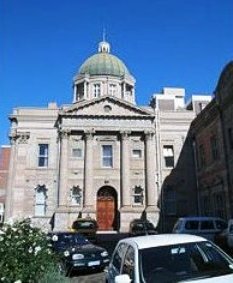 The building was unoccupied until 1902, when it was used without being officially opened, due to the fact that the country was engulfed in the Anglo-Boer war. The war also affected the Legislative Assembly, which had to move the venue of its sittings when the chamber was used as a military hospital. The Legislative Assembly and the Legislative Council buildings, both national monuments, formed a colonial Parliament of two houses: a Council of 11 nominated members and an Assembly of 37 elected members. The Natal Parliament was disbanded in 1910 when the Union of South Africa was formed, and the Assembly became the meeting place of the Natal Provincial Council. The Council was disbanded in 1986. The African National Congress (ANC) hold power in the provincial legislature, although they won the province by a very small majority in South Africa's 2004 elections. Their chief opponents were the Inkatha Freedom Party, allied with the Democratic Alliance. KwaZulu-Natal, as the name may suggest, is also the home to the Zulu monarch, King Goodwill Zwelithini kaBhekuzulu. Although not holding any direct political power, the Zulu king is provided a stipend by the government, and holds considerable sway over more traditionalist Zulu people in the province. To date, the Zulu king has thirteen wives. Traditionally, each year a ceremony is performed in which the king receives another wife. The current King has kept this ceremony, called the "Reed Dance", but not chosen a wife, instead using the ceremony to promote abstinence until marriage, as a way of preserving Zulu culture and preventing the spread of HIV/AIDS. Durban is a rapidly growing urban area and is by most measures the busiest port in Africa, with a good rail network linking into Southern Africa. Sugar refining is the main industry. Sheep, cattle, dairy, citrus fruits, corn, sorghum, cotton, bananas, and pineapples are also raised. There is an embryonic KwaZulu-Natal wine industry. In addition to sugar refining, industries (located mainly in and around Durban) include textile, clothing, chemicals, rubber, fertilizer, paper, vehicle assembly and food-processing plants, tanneries, and oil refineries. There are large aluminium-smelting plants at Richards Bay, on the north coast. The province produces considerable amounts of coal (especially coke) and timber. About 82% of the population is black. During apartheid, a large percentage were forced to live in Bantu homelands (Bantustans), which had a subsistence economy, based on cattle raising and corn growing. Wildlife and tourism is increasingly important to the economy of KwaZulu-Natal. 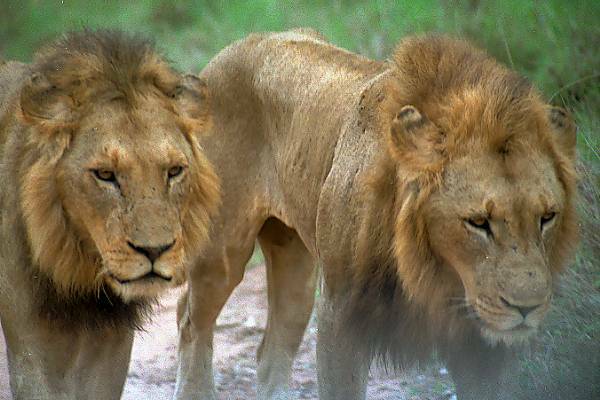 Tourists pay up to $10,000 for safaris on which they might see lions, elephants and giraffes. 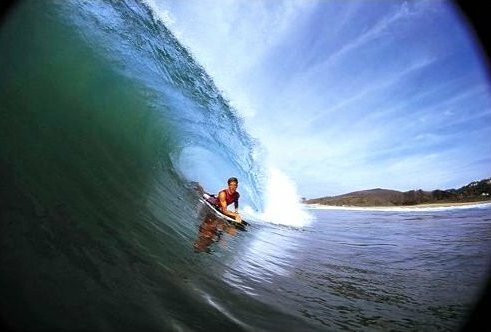 Gunston 500 - a premier international surfing event hosted in Durban. AmaZulu, from Durban, Golden Arrows and Thanda Royal Zulu also from Durban, Maritzburg United, from Pietermaritzburg. The Sharks, who compete in the Super 14 with four other South African teams, four teams from Australia, and five from New Zealand. Natal Sharks (closely connected to, but not to be confused with the Super 14 team), who compete in South Africa's domestic competition, the Currie Cup. The Dolphins, the successor to KwaZulu-Natal, who compete in South Africa's domestic first-class competition, the SuperSport Series. In June 2007 the KZN parliament passed the Prevention of Slums Bill in the Provincial Parliament. The Bill compels landowners to evict shackdwellers, on the threat of arrest and criminalises resistance to evictions. The provincial Department of Housing, that brought the Bill to the Provincial Parliament, has repeatedly stated that 'the slums will be cleared by 2010 in KwaZulu-Natal'. The Bill has been heavily criticised by academics, human rights organisations and civil society. The shack dwellers' movement Abahlali baseMjondolo is planning mass mobilising against the Bill and is also taking the matter to the Constitutional Court with support from a pro bono legal centre. The province has three different geographic areas. The lowland region along the Indian Ocean coast is extremely narrow in the south, widening in the northern part of the province. 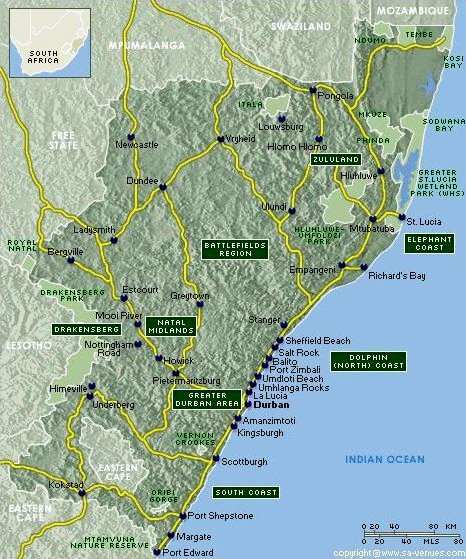 The central region is the Natal Midlands and is an undulating hilly plateau rising towards the west. Two mountainous areas are contained in this area, the Drakensberg Mountains in the west and the Lebombo Mountains in the north. The Drakensberg is a solid wall of basalt, rising over 3000m skyward near the Lesotho border, whilst the Lebombo Mountains are ancient granite mountains, forming low parallel ranges running southward from Swaziland. The Tugela River flows west to east, across the center of the province and is the region's largest river. The coastal regions typically have subtropical thickets and deeper ravines and steep slopes host some true Afromontane Forest. The midlands have moist grasslands and isolated pockets of Afromontane Forest. The north has a primarily moist savanna habitat, whilst the Drakensberg region hosts mostly alpine grassland. The former Eastern Cape enclave, of the town of Umzimkulu and its hinterland, have been incorporated into KwaZulu-Natal, following the 12th amendment of the Constitution of South Africa. The amendment also made other changes to the southern border of the province. KwaZulu-Natal has a varied, yet verdant climate, thanks to diverse, complex topography. Generally, the coast is subtropical with inland regions becoming progressively colder. Durban, on the south coast, has an annual rainfall of 1009mm, with daytime maxima peaking from January to March at 28°C (min: 21°C), dropping to daytime highs from June to August of 23°C (min: 11°C). Temperature drops towards the hinterland, with Pietermaritzburg being similar in the summer, but much cooler in the winter. Ladysmith in the Tugela River Valley reaches 30°C in the summer, but may drop below freezing point on winter evenings. The Drakensberg can experience heavy winter snow, with light snow occasionally experienced on the highest peaks in summer. The Zululand north coast has the warmest climate and highest humidity. KwaZulu Natal is divided into 11 districts. One of these, eThekwini, is a metropolitan municipality and the other 10 are district municipalities. The province of KwaZulu Natal has 117 cities and towns in total. 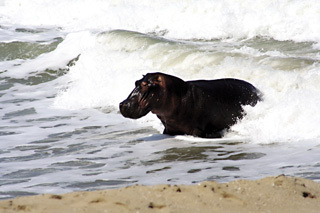 Huberta was a hippopotamus and one of the most famous animals in South African history. In November 1928, Huberta left her waterhole in the St. Lucia Estuary, in Zululand and set off on the 1600km journey to the Eastern Cape, a journey which would take her three years. In that time Huberta became a minor celebrity in South Africa and attracted crowds wherever she went. She was initially thought to be a male and was nicknamed Hubert by the press. She stopped for a while at the mouth of the Mhlanga River in Natal and a failed attempt was made to capture her and put her in Johannesburg Zoo. After this, she headed south to Durban, where she visited a beach and a country club. Moving on to the Umgeni River, she became revered by Zulus and Xhosas alike. Finally she arrived in East London in March 1931. Despite her having been declared Royal Game (and thus protected) by the Natal Provincial Council, she was shot by hunters a month later. After a public outcry, the hunters were arrested and fined £25. Huberta's body was recovered and sent to a taxidermist in London. Upon her return to South Africa in 1932, she was greeted by 20,000 people and can now be seen in the Amathole Museum, in King William's Town. The KwaZulu-Natal Midlands is an inland area of KwaZulu-Natal, South Africa, that lies around Pietermaritzburg, and includes the Drakensberg mountain range. There are several small towns located in the Midlands, including: Howick, Balgowan, Nottingham Road, Rosetta, Estcourt, Mooi-River, Greytown, Richmond and Ixopo. Drakensberg towns of Underberg, Himeville, Winterton and Bergville are included. On this site, the East Griqualand area, including Kokstad and Matatiele is also included in the Midlands area. The Midlands Meander consists of several tourism routes, that include accommodation, art and crafts and restaurant stops…. 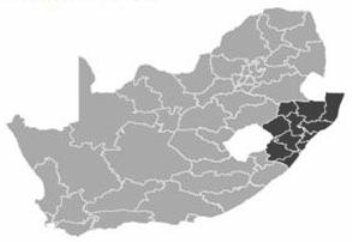 This is a huge area, but with the exception of a few major towns, like Ladysmith, Colenso, Dundee, Glencoe, Newcastle and Vryheid, this region contributes little to the industrial and commercial wealth of KwaZulu-Natal. It does, however house several major game-parks and tourist attractions. Steeped in history and the scene of some of the worst battles in South African history, between the Boers and the British and also the Zulus, this area has many museums and sites to visit….